Did you know? Century Sun Oil is comparable to or BETTER than olive oil in health benefits. We grow a variety-specific seed that is 85% monounsaturated, and naturally higher in vitamin E than olive oil. So when you research and compare cooking oils, be sure you search for high-oleic sunflower oil--there is a difference! 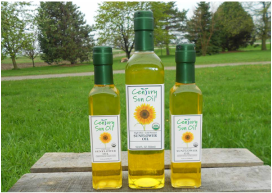 Century Sun Oil, LLC, was founded in 2009 with the vision of producing a healthy, local, certified organic cooking oil. 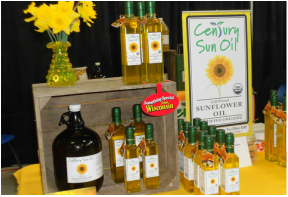 Century Sun Oil is a versatile all-purpose sunflower oil which enhances the flavors of all your favorite recipes. 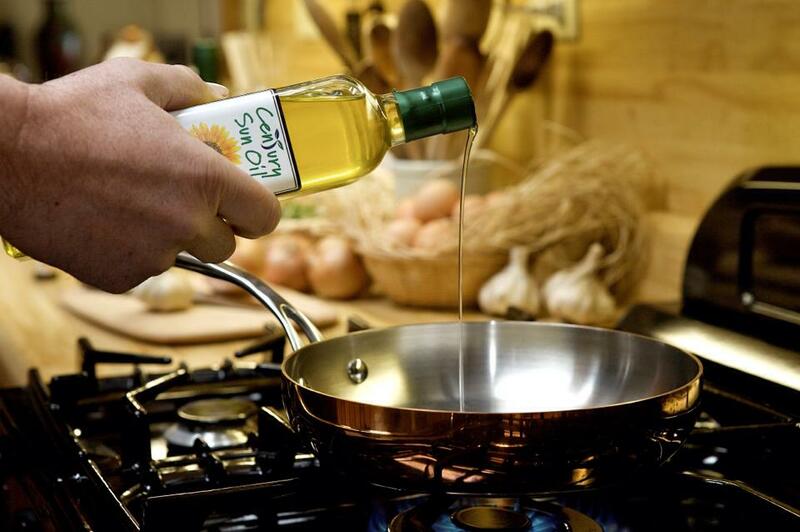 Our high-oleic sunflower oil is a great addition to your heart-healthy lifestyle. Located on a 135-year-old family farm just outside Pulaski, Wisconsin, our sunflower oil production facility incorporates the original dairy buildings on the farm. Our buildings were re-purposed with new updates to create a truly local efficient system. Century Sun Oil starts by requiring a specific variety of certified organic high oleic sunflower seed to be used. Planting, soil nutrition and crop monitoring throughout the growing season is done in partnership with our organic farmers. From there, the seeds are carefully harvested and stored until ready for pressing. All operations from cold pressing, filtration, bottling, packaging and shipping are performed at the Century Sun Oil facility. Our only focus is sunflower oil, we do not process any other seeds. To complete the eco cycle, our residual meal is sold to organic animal farmers for a much-needed high protein supplement. This is an added benefit for both us and the farmers, as there is no waste being created. Century Sun Oil's processing methods are also certified organic, which means no chemicals are used in any part of our production system. Our cold-pressed and lightly-filtered methods allow for all of our sunflower oil's natural healthy constituents to remain for you to enjoy. ﻿See the many benefits of high-oleic organic sunflower oil and how it can help complement a healthy lifestyle. And remember to support food products like ours that are GROWN and PRODUCED entirely in the USA! Visit the Century Sun Oil Blog to learn more about certified organic high-oleic sunflower oil, including recipes and other sunflower oil uses. Plus lots of information-packed articles! ﻿﻿﻿﻿﻿﻿﻿﻿Century Sun Oil is available in 55-gallon drums and 275-gallon totes! Contact us for special per-pound pricing on these sizes. To our Chicago customers - you can even order drums through our fantastic distributor, Local Foods!